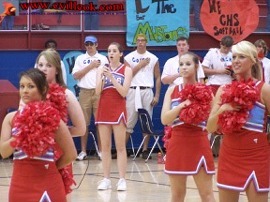 Cheerleader Shelby Charles sang the National Anthem at a CHS pep rally Friday. 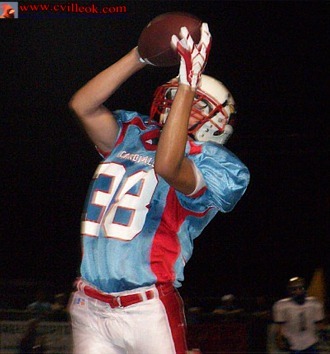 Lane Coulter keepers were effective in Collinsville's first offensive series (after Dalton Rasmussem intercepted an Oologah pass near midfield stopping their first possession). 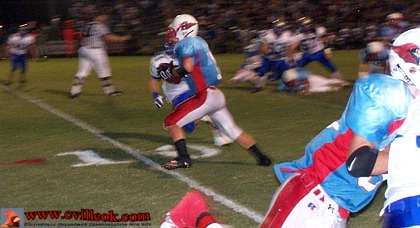 Coulter reached the Oologah 17 yard line (above) after Merin Oakley and Kyle Rush carries reached Oologah's 40 yard line. Kevin Phillips reached the Oologah 1 yard line on this pass play on Collinsville first series but the play was called back to the 30 apparently due to the block (or illegal use of hands?) in the forground of this photo..
Dalton Rasmussen caught this 4th down pass but was out of bounds and Oologah took over on downs at their own 26 ending the Cardinals' first possession. Jarred Billups punted from just outside the endzone on the 2nd Cardinal possession which started at the 9 on an Oologah punt. Collinsvile started their 3rd possession at the 5 yard line (early in the 2nd quarter) after another Oologah punt. Kyle Rush carried the Cards out to the 10 before this Lane Coulter pass was intercepted and run back for an apparent TD. 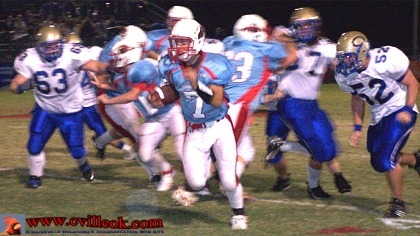 Instead, an illegal Oologah block on the run back started Oologah at the Card's 18. 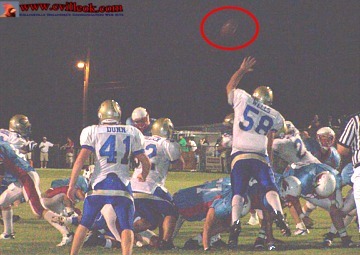 Oologah only gained 2 yards to the 16 before a fake field goal pass play (above) reached the 3 yard line. Collinsville's defense came up big with Brandon McCoy recovering an Oologah fumble at the 4 yard line (above) with 9:10 left in the 2nd quarter and the score 0-0. 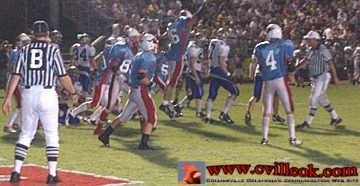 Collinsville ran 1 play (left) with Merin Oakley up the middle and a 1 yard loss. A high snap to QB Lane Coulter on the next play caused a safety as Coulter covered the ball in the Cardinal endzone and Oologah gained 2 points and a kick off from Collinsville. 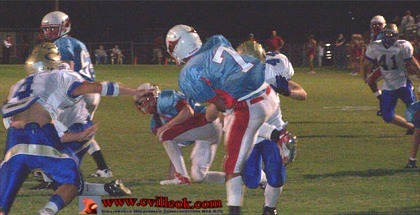 Oologah punted back after the safety and Collinsville started at their own 22 and 5:48 left in the 2nd quarter. 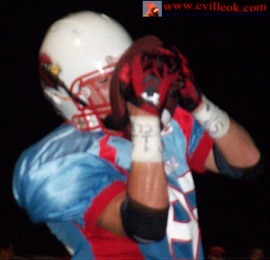 A pass to Steven Majike got Collinsville to the 46. A reverse to Merin Oakley reached Oologah's 42. An offsides and a pass to Trey Blissit (above) moved the Cards to Oologah's 18 yard line with 3:56 left before halftime. 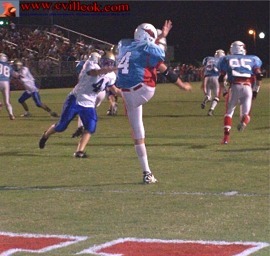 Collinsville took 3 points off the board after Kevin Phillips made this field goal on 4th and 6th. A roughing the kicker penalty instead gave Collinsville a first down at Oologah's 6 yard line at 1:50 in the 2nd quarter trailing 0-2.